With its remarkable and diverse collection of exhibits, the Archaeological Museum in Delhi is a must see for people of all ages, especially kids. Traces its history from 1911 when it was situated in Naubat Khana, Archaeological Museum, however, later shifted to Mumtaz Mahal in Red Fort. Initially, the museum was set up with an aim to showcase the Mughal culture through their exquisite pieces of art, however, with time it also exhibited other annals of Indian history. Moreover, at present, this museum in Delhi comes under the aegis of Archaeological Survey of India. On display, there are various paintings, artefacts, statues, and murals that date back to the medieval era. For tourists, the museum has three galleries, each dedicated to a separate period. The first gallery displays artefacts and antiquities from the 2nd and 3rd centuries. On exhibition, the gallery also includes a number of miniature paintings, manuscripts, royal orders, and stone inscriptions that belong to the great Mughal emperor Akbar I along with his successors. Whereas, the second gallery consists of miscellaneous artefacts which include coins, bronze statues, upholstery, seals, rock edicts, and coins from the Indus Valley Civilization. Also, the gallery houses preserved devices that were used for astronomical calculation. Furthermore, the last section of the museum is purely dedicated to the relics that date back to the Indian rebellion of 1857. In 1747 and 1857, during the time of Nadir Shah’s invasion of India and Indian Rebellion, a number of Mughal belongings of the Red Fort were either stolen or looted by the Britishers. These looted gems were then sold to either private collectors or to the British Museum, British Library and Victoria Albert Museum; Koh-i-Noor Diamond being one of them. As you will further explore the museum, you will be amazed to see a section which is solely dedicated to last Mughal Emperor - Bahadur Shah Zafar. This segment comprises the preserved masterpieces of his famous ghazals. Also, on the display, there is an ink pot, pen holder, and a perfume sprinkler that belongs to Bahadur Shah Zafar. Along with that, here at Archaeological Museum, one can also expect to see the royal attires of emperors and empresses of Mughal dynasty. One of the main attraction of this museum is the finest assortment of weapons of Mughals that mainly include sword and daggers. Therefore, a walk through this beautiful museum and a prominent historical site in Delhi is a journey that takes you back to the time when Mughals built their empire in Delhi. Artefacts from the Mughal period. Weapons from the Rajput period. 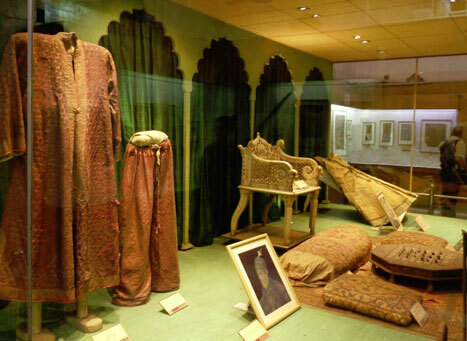 A Dedicated Gallery exhibiting personal belongings of Bahadur Shah Zafar. Royal Attires of Mughal emperors and empresses. Bronze Statues, Seals, and Coins, from Indus Valley Civilization. There is no entry fee for the museum. However, you have to pay a nominal entry fee to enter Red Fort. Please Note: The entrance charges vary if you choose light and sound show on your Red Fort sightseeing tour. Red Fort, Delhi - 110006. Chandni Chowk serves as the nearest metro station from the archaeological Museum. The station lies on the Yellow line metro. From the station, you can take an auto to reach Red Fort which is located at a distance of 2.2 km.